Struggling for ideas on what to cook? 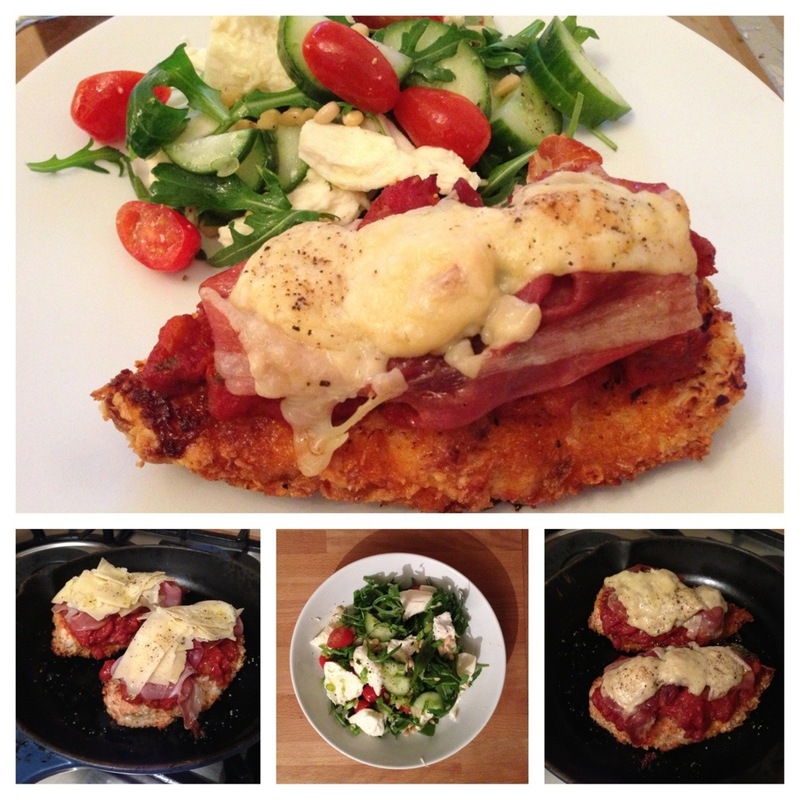 Why not try my Chicken & Chorizo Parmigiana for a quick and simple saturday meal. This recipe makes a bit more Parmigiana sauce than required, as I like to cheat a little and use the leftovers in other recipes. Firstly to make the Chorizo sauce heat up the oil in a large saucepan on a medium heat. Add the finely diced onion and fry for 5min stirring constantly. Add the minced garlic. Remove the skins from the chorizo sausages, break them up and fry for 5 mins. Add the oregano and capers, season with salt and pepper, then add the purée and tomatoes. Bring to a simmer and cook for 1hr. Meanwhile turn the oven to 180 degrees. In a oven proof frying pan on a medium heat add the oil. Prepare the battered chicken by rolling in flour, dipping in beaten eggs, then roll in breadcrumbs. Place in the frying pan until golden, then turn over the chicken and put into the oven for 20mins. Prepare the salad by simply placing the rocket into a bowl. Add the chopped tomatoes, cucumber and spring unions. Tear the mozzarella on top. Add the pine nuts, garlic oil and season with salt and pepper. Once the chicken has cooked, remove from the oven and top with prosciutto and shaved cheddar cheese. Then add back to the oven for 10mins until the cheese has melted. Serve immediately with a beer or glass of white wine. This entry was posted in Kitchen Creative and tagged Chicken, chorizo, dinner, healthy, parmigiana, recipe, salad, simple by whysamiam. Bookmark the permalink.